Made of forged iron, several components riveted together, attractive patina all over the surface. Original examples like the present one are very rare in private ownership. The majority of circulating pieces are 19th or 20th century replicas. The punishment mask was usually forged of iron and firmly attached to the delinquent’s head. Wearing this the authorities either led him through the streets of the town or tied him to the pillory, which meant an additional component of punishment in form of a public disgrace. Justice castigated persons by using this measure for insulting, defamation or a slovently lifestyle, for instance. 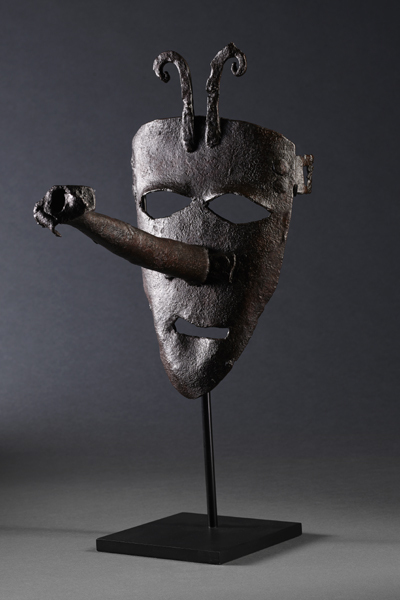 Suchlike masks existed in a great variety of ways and were often designed as grotesques referring to the misdeed. They could also include additional devices like a knob inserted to the mouth in order to prevent the delinquent from speaking or bells for attracting the attention of the surrounding people when moving the head. Sometimes the design of punishment masks forced the fixation of the chin and insertion of a whistle into the mouth.